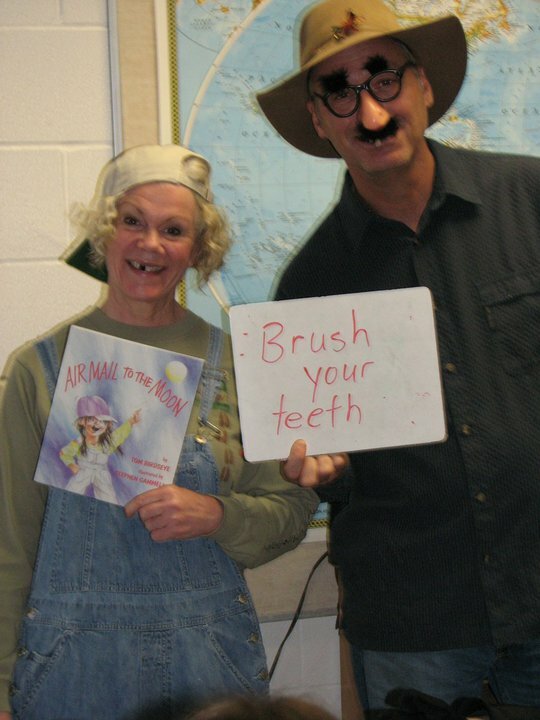 Me and my teacher buddy "Orel"
Well, I thought you'd all like to see a picture of you dear old Mom/Granny on Halloween at school! 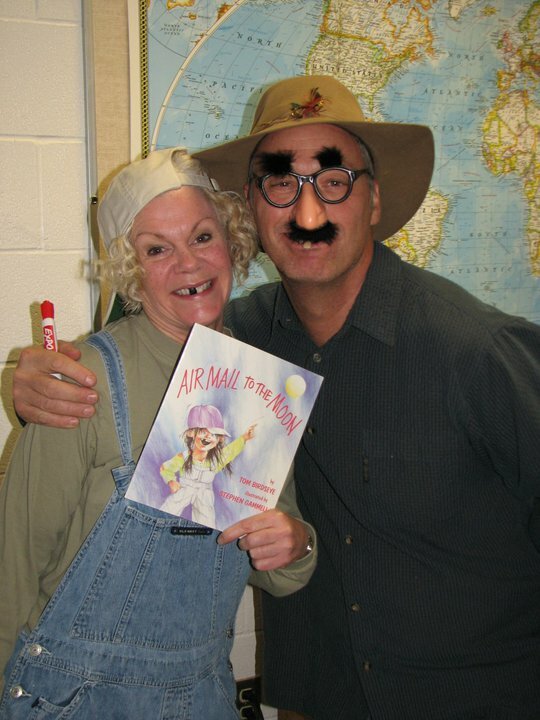 Here I am with my good friend Orel Higene (aka Ron Stone - 4th grade teacher) We saw each other at the school Halloween parade, and immediately realized..... We have the same dentist! Trevor, we need you! There's plenty of work waiting for you in North Idaho!!! Apparently I have to download a CD and study it before I can add the photos from Dad's new camera onto the computer.... Anyone want to make a quicker suggestion? I've got the camera hooked up to the computer, but nothing happens... so, I guess I'm just going to have to do some studying - except that I was hoping to get this done quickly since I've got LOTS to do (big surprise...) and there's a picture of Ashlyn meeting ARIEL, for crying out loud! We've got to get that on the blog! Wednesday and Thursday we spent time at Disneyland with Ava and Vivian and their parents (Lindsay and Riley) so we could have it all scoped out for when the other grandkids came on Friday!!! Here is a shot of Ava taking her grandpa on a bumper car ride at "Tuck and Roll" in the Bug's Life area at California Adventure on Thursday. Looks like F-U-N!!! The Carousel was a favorite - either the disney one with all of the beautiful horses, or the one with all the sea creatures at California Adventure. They were both high on the list of 'we-gotta-do-that-again'! Aren't fairies supposed to be SMALLER than average kids? They look pretty tall here! I thought it was so cute to see these fairies having such a serious 'fairy' discussion with Ava. If I remember correctly, they were discussing when she would get her wings! And then there's "Baby Vivvy" as Ashlyn liked to call her. She was very happy that Gramma wanted a Mickey Mouse ice cream treat. She was intent on getting her fair share! I think we even got a better picture the next day when she got another one! This past weekend (July 10th) Coeurimba was invited to play for the Chataqua at Chewela, Washington. This was my third time there, and it has always been a fun event, so I was able to convince Steve that it would be ok to play 'chauffeur' to most of the Coeurimba gang and attend the event with us. He liked it! I asked him to be our photographer, too, so I could put some new pictures on the blog - that's why most of them feature 'yours truly' - but I guess they are still interesting! I don't remember which song I was playing in this first picture, but it's a soprano marimba, so that's something! I do remember what I was doing in this picture! I was introducing "Shariaku" to the audience - it's the African 'Romeo and Juliet' without the tragic ending. I also get to play lead for that song, so I really like it! That's me on the bass - duh! Duh is right! I well remember which song we were playing here: Chipandani! I had a fine practice and warm-up with the song, but when it came time to perform, I just couldn't do it right until I finally got to segue into the main part of the melody and play a bit easier rhythm! Oh, well, nobody except us players really knew I flubbed it! And here is a shot of our performance space. It's really cool with lights and all! We felt like such super stars! And they LOVED us! Ah, life is fun! It's official! I passed the Praxis test! I am now accepted as a certified music teacher - thanks to study and prayer. I'm NOT kidding! I was promised that if I did my part and studied to the best of my ability I would not only pass the praxis, but I'd pass it with "flying colors". Well, after taking the test, I wondered if that blessing was for the first time I took the test, or a subsequent time, but I found out that even though I had some 'doubting Thomas' tendencies, I was still blessed beyond my abilities. I needed 148 points to pass, and I scored 165!!!!! Proof positive that miracles have NOT ceased! Now all I've got to do is teach! This picture is for Heather. Teresa heard about the half marathon, and she decided to show you her medals for winning races - she said that since most serious runners run longer races, she usually wins for her age group in the 5k and 3k's because most ladies her age (73) walk! Here we are making last minute preparations for the retirement party at Mary's house. Left to right: Teresa, Mary, Viva, Crystal (traveled to Europe with Ellen when we were in Belgium - remember her?) Ellen and John. Teresa's graduation from Law School picture! This one is for Lindsay. These earrings (Kathy took the picture without her glasses on - that's why it looks blurry....)are made from bottle caps taken from a soda that Robert liked on one of his trips to Mexico. They were so cute! Thought you might like the idea. Teresa has a soda bottle cap necklace, too. Kathy and Judy - sister and niece. Judy is Ellen and Ruffin's mom. Amanda (Philipp's wife) and Mary, my niece. Lance - Mary's 'man' and one of my favorite people! On the right is Philipp, Teresa's son, my nephew - I don't know the other guy. Ruffin and his wife - forgot the name, but she is a really nice girl. Another earring shot... and I'm holding one of the 400 mini-cupcakes that Viva made for the party. They were pretty spectacular - especially the Persian love cakes with the dried flowers on top! Teresa, Kathy and little Teresa. Mary and Kathy. It was a great time together. We all want to plan to get together around Dallas next Spring. Start making plans! Next is my line up of Cowhands singing "Cowboy's Lament" (aka 'Saddle Sore') while riding some of the cutest stick horses ever! Ms. Deyo the art teacher made about 7 of them for the program, and she even gave them names like 'Zeke' and 'Princess'! How cute!!! Next is the opening scene: a backyard campfire with fake marshmallows on sticks 'roasting' over a flickering campfire. We dimmed the lights and turned on the disco ball for a 'starry' night effect and sang 'Home on the Range' and 'Little Old Cowboy'. Cute is a word I'll keep using to describe this show, I promise! The next picture is of me and my 5th grade stage crew. They love doing their jobs, and I really give them stuff to do, to! They hand out and collect props, set the stage up, run sound and lights, and help clean up and get the music room put back together after the program. They are a bunch of great kids! And the last one is a picture I tried and failed to turn right-side up! I am posing with one of the great "Deyo Horses". She really is an artist! We had a cardboard train, sheep, cow, pig, mountain and tunnel, too! What a fun show. I had lots of help from the parents, too, so it was fun working with them and getting to know them better. What a fun evening! OK, on to passing the Praxis in 6 weeks, and I'll only have school to worry about! YEEE-HAAAW!!! At long last - NEWs! Well, I am not only the proud owner of a real piano that I am actually learning to play (and I even love to practice!) but this weekend I bought my first ever pair of REAL cowboy boots! And they are cool, too! I've wanted a pair of cowboy boots since I was 6! I even had a horse as a kid, but you know, cowboy boots aren't cheap, and you can ride a horse in tennis shoes, so I never got that pair of boots - until yesterday! And the saleslady (at D&B Farm and Home!!!) was so nice! She found out that I'd waited so long (Steve said 20 years... but that makes me younger than my kids...) and she wanted me to get the PERFECT pair! So, how do you think I'll look with my jeans, boots, hat, western shirt (when I find one) and bandana around my neck when I lead the first graders in their program "How the West Was Sung" on the 29th??? Lookin' goooooood! But, it won't let me put the pictures on the post! Help! You need to see my cool cowboy boots! Read it on my blog or do without! I have tried to figure out how to 'post' anything on my facebook page, and I simply cannot figure out how to let people know anything at all! So, read it here or go without news from me. I'm old. Deal with it. Last night we had our "Julie Johnson Jamboree" at Lake City High School. You can see pictures on the Coeur d'Alene press web site. (Dad took some, but I don't know how to get them off his new camera...) Anyway, our kids performed "Mutiwambuya" and it was really fun: rhythm sticks, djembes, marimbas, "Boomfloppers", chanting, singing and a big, loud "GO, GO, GO TEMA!" that shook the rafters and ended perfectly with not a sound happening after! It was the coolest dramatic moment! The audience sat stunned for a couple of seconds before they burst into applause! The rest of the evening was just as cool with each chorus performing really great and quite varied music. There were other marimbas, an electric guitar (by a 4th grader who is already a virtuoso on the guitar!!!) and a drummer (Garret Knotte who is also a member of Couerimba who is in 7th grade!) Anyway, a really cool night. Lots of fun. That's my news - now I'm going to plan next week's lessons! What did you do with your Spring Break? Well, while I was gone to St. Louis to play with grandkids and just kick back and have a little fun, Steve had to stay behind to get some business done. Good thing. A pine tree from our back yard blew over in a storm and crashed through our roof! Steve said it looked like a war zone. It will be well into 'cleaned up and getting fixed' before I get home on Saturday, so I'm just waiting for pictures to be e-mailed to me. The good news is - besides the fact that mostly we just have to do clean up and repair - nobody was hurt and it didn't hit anything that we'd have to replace besides perhaps a bit of furniture. Sure, the ceiling, walls and roof are in bad shape, but the trusses were so strong they kept the thousands of pounds of pine tree from actually crashing through more of the house. Not to mention that Steve was not home sitting in the chair watching T.V. RIGHT under where the tree fell. And his car wasn't in the driveway where the top of the tree sent the bricks from the chimney! All-in-all I'd say we were pretty lucky. And, insurance will be paying for most of the bill, so it's all good. A bit inconvenient, sure, but lucky! Well, what a wonderful treat for Spring Break! I got to come to St. Louis (Edwardsville, Ill) and play with the grandkids. But that's not all! Saturday I got to hop in the car with Heather and drive out to Ohio (my first trip there...) and meet some of my favorite cousins! 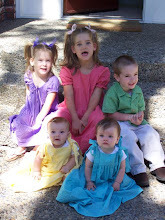 (I've never met them before, but they quickly became some of my favorite people!) This has been a really cool treat. Pete Roan (aka Kenneth Jr.) is my cousin's son - so my first cousin once removed. His son, Tater (aka Matt) is a 25 year old good-lookin' Roan boy who is in law school. I promise, once I find pictures I'll post them. His wife had a baby the day before we got there and she is C-U-T-E!!! (yes, both mother and baby are cute!) Anyway, we (Heather and I) had such a great time with those guys! I hope they can come visit us, or we can have a reunion or something. It was so wonderful to meet them and just sit around and visit (and stare!) for a while. I want to do it again! Lewis and Clark....That's Clark and Lewis! Woo-hoo! My life just got easier! Lewis and Clark went off without much of a hitch this evening, and I got applause and flowers! The kids did great, I have the day off tomorrow, and life is getting easier now! All I have left is the third grade, second grade and first grade programs - but they are all so much fun (and quite a bit easier than "L and C") - that I am looking forward to putting them on. Life is good - now I just have to study my brains out so I can pass the Praxis! I hope there's room enough in my head for all of this new stuff! Well, I've just started piano lessons and tutoring sessions so that I can pass my praxis on June 12th! I'm just cramming information in, but it is fun to learn at the same time. If I seem distant or unresponsive, let me give you a quick overview of my week: Monday at school 7AM - 4PM meeting at MidTown center to introduce new teachers (me - they'd notice if I didn't show up...) Then home to finish off preparing 2 more lesson plans for kindergarten and first grades; Tuesday school 7 - 4 then Coeurimba 7 - 9PM; Wednesday; Special Chorus rehearsal before school, school collaboration until 4PM and then District collaboration until 6PM; Thursday; school 7-3:30 (I leave early so I can get to Bryan by 4PM to have a tutoring session with Sally until 6PM. Friday I have the day off (HA HA!!! - yeah, so I can do laundry and prep my lessons for next week - and have a piano lesson on Friday afternoon!) Then Saturday usually is 'mop-up' from what I didn't get done during the week (including that laundry I probably ignored on Friday). My Christmas decorations will probably be up until after the praxis test in June. I just have to use every spare minute to cram info into my little old head! Anyway, just remember I love you all, and when I pass that test I'll be a relaxed gramma again! Woo-hoo!